In any tale as old as time, there's bound to be more than a handful of secrets—and when the tale's being told by a studio with a history as rich as Disney's, those hidden details are destined to be even sneakier. The live-action Beauty and the Beast is absolutely no exception to this rule, with the director, set designers, and even lighting coordinators all coming together to slip in under-the-radar mentions of a bunch of other movies, musicals, and more. 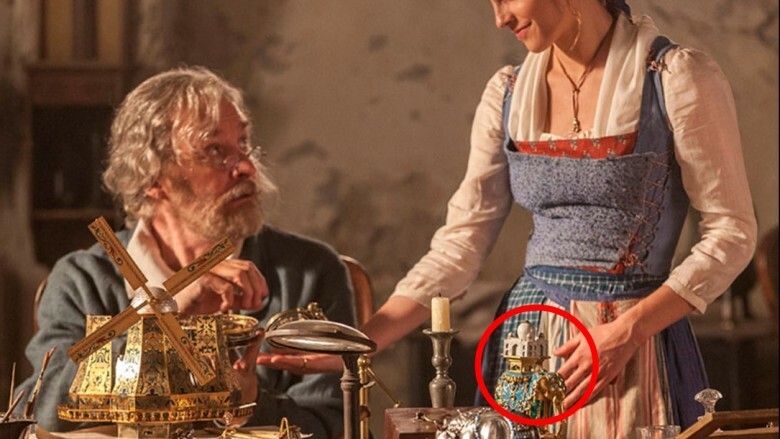 Here are the Easter eggs in Beauty and the Beast that you totally missed. We all know the Beast (Dan Stevens) is coated in fur and sports a rockin' beard. But when he transforms back to his human form, Prince Adam, he's clean-shaven—a change that seems to leave Belle (Emma Watson) pining just a little for the old days. During the ending ballroom scene, she pauses to look at him and asks if he'd consider growing a beard. On the surface, this hardly seems like an Easter egg, let alone something worth mentioning at all, but it actually has a deep connection to Disney's 1991 animated take on the story. 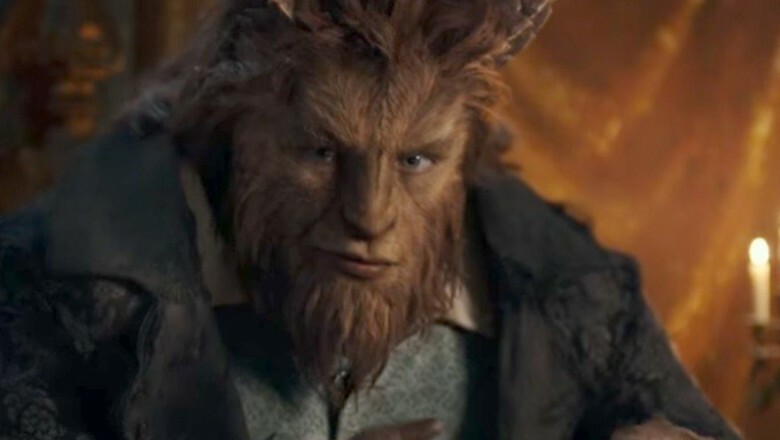 Animator Glenn Keane revealed that he "wished the Beast had stayed a beast" rather than metamorphosed into a "princely human" once again. Though Keane's wishes didn't come true, he did attempt to meet somewhere in the middle by penning a line for our bookish Belle. "I had them record Belle saying, 'Do you think you could grow a beard?'" Keane said in an interview with ScreenRant. "It was a good idea. It's not in the movie. We should have put it in there." Looks like they finally did… just 26 years later in the live-action remake. As with many other Disney films (and their live-action remakes), 2017's Beauty and the Beast bursts with brilliant visuals and bold song-and-dance numbers. But one scene in particular stands out, and it's also chock-full of wonderful Easter eggs. In a short, sly moment during "Be Our Guest," Cogsworth (the incomparable Sir Ian McKellen) shakes the rust off his ol' second hand and jumps into the festivities. 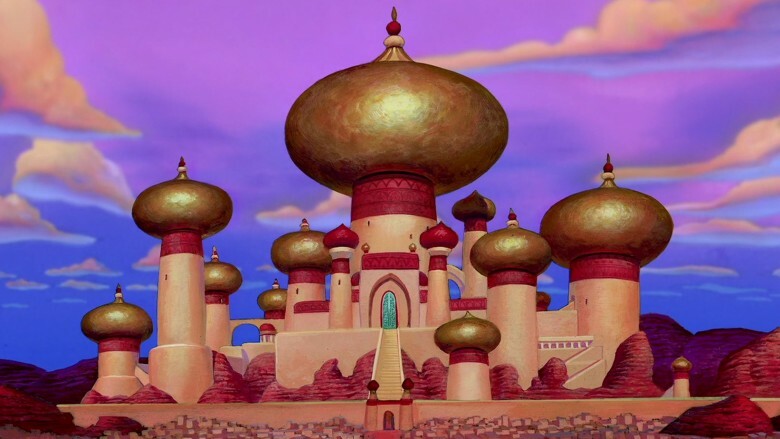 He makes a grand entrance into the ballroom blitz, bursting out of an ornate palace that looks almost exactly like another famous Disney structure: the Sultan's Palace, smack-dab in the middle of Agrabah in 1992's Aladdin. Similarly, the slightly curmudgeonly clock is seen wearing a billowy turban reminiscent of the titular street rat-turned-prince. Admittedly, this is a pretty noticeable reference for those who know the governess Maria von Trapp and the seven kids she looks after, but we can place a hefty bet that a number of Beauty and the Beast viewers in 2017 might not have noticed Belle's hilltop moment as anything more than simply a stunning landscape and a swell in one of the film's most popular songs. However, when the brainy not-quite-princess climbs to the lush grass to belt her heart out, the shot framing, direction, and set and costume design is almost uncannily similar to a pivotal moment in the 1965 musical The Sound of Music. Side by side, the skeleton of both scenes is the same: bright grass; a blue apron dress worn over a white top (and in Belle's case, with a cropped, embroidered jacket on top of that, too); the 360-degree camerawork. 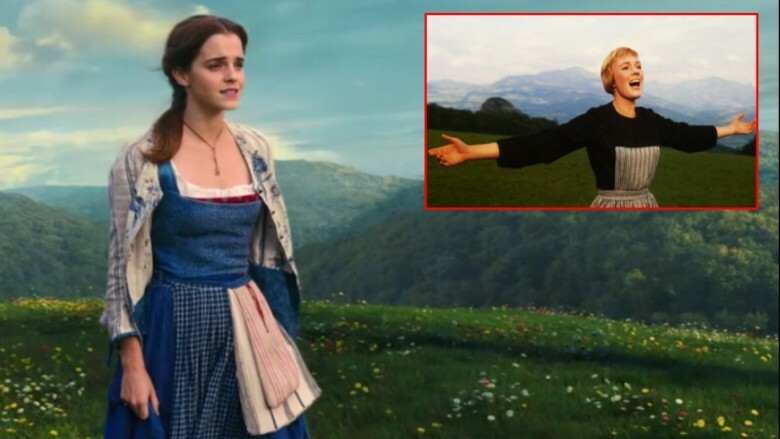 The live-action film modernizes this Sound of Music moment, making for a pretty fantastic Easter egg, and one you might not have noticed if you didn't know that a doe is "a deer, a female deer." Let's rewind back to the dinner party, shall we? 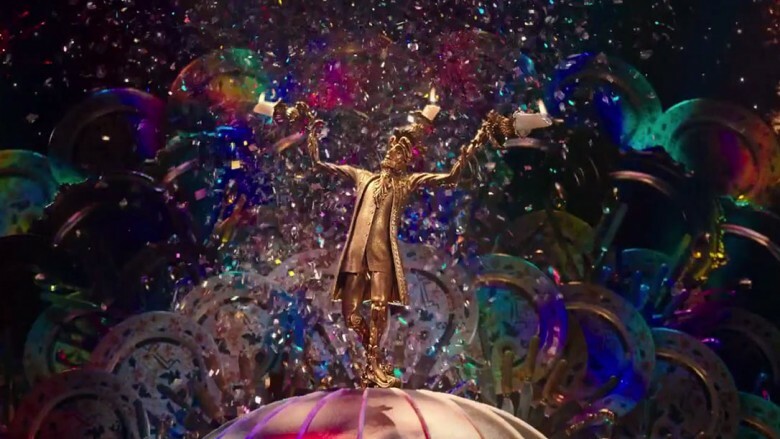 Cogsworth let loose, Belle was thoroughly impressed, and the creatives behind 2017's Beauty and the Beast were busy sprinkling in more references to musicals—this time centered around the lovable candelabra Lumiere (Ewan McGregor). Lumiere's big moment during the party includes another sneaky reference to a musical-turned-movie. In a blink-and-you'll-miss-it moment, he strikes a dramatic pose beneath a high-contrast backlight, similar to the visuals in "Cell Block Tango" from the Broadway hit Chicago. To see the reference, keep your eyes peeled when the song builds and Lumiere turns his back to Belle, his shadow expands, and you may end up involuntarily snapping your fingers. There's definitely a trend here with "Be Our Guest" as the source of most of the film's slyest Easter eggs. Another lightning-fast bit happens after Lumiere sings "Go on, unfold your menu." Belle does so, taking a glance at the expertly-crafted course of meals prepared by the castle's kitchen staff. It all looks wonderful, but take a closer look, and you'll see a reference to none other than 1989's The Little Mermaid. 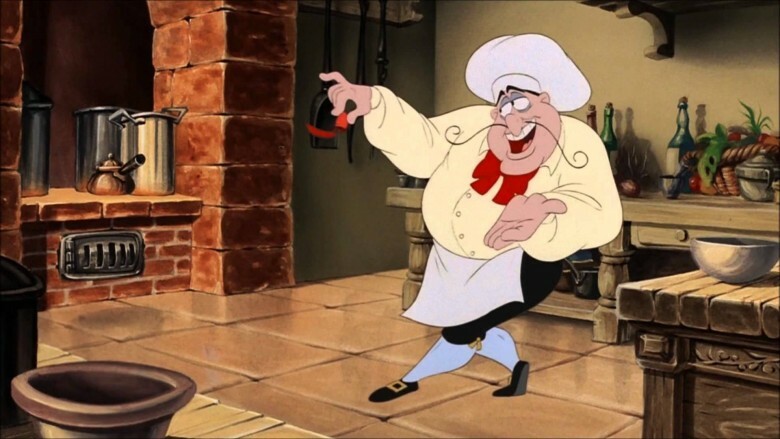 Belle is set to eat Les Poissons as her entree—and as every Disney fan knows, "Les poissons" translates from French to English as "cooked fish," the absolute favorite dish of Chef Maurice (and a catchy song) from The Little Mermaid. Tie together all the elements of "Be Our Guest," and you'll see a much larger theme—one that is itself an Easter egg. During dinner, there are a number of instances in which the houseware work in conjunction to execute kaleidoscopic choreography reminiscent of the work done by renowned film director and musical choreographer Busby Berkeley. In particular, there's a moment similar to Berkeley's "human waterfall" in 1933's Footlight Parade, which also brings to mind Esther Williams, the "princess mermaid." During the 1940s and '50s, Williams took the water world by storm, making a splash (pun intended) with her synchronized swimming. Mrs. Potts (Emma Thompson) takes a stab at the underwater sport, making waves in the bubbled-up sink before bending in tune with the other personified pots and pans. They'll slip by anyone without a little background knowledge, but sharp-eyed fans should be able to spot these Easter eggs in the aforementioned kitchen sink swimming, feather duster dances, and the waves of kitchenware that ripple in exact time with one another. Belle's father Maurice (Kevin Kline) has always been a quirky character, and in the live-action film, his desk is cluttered just the way you'd expect a creative's to be: drawing papers here and there, tools to fix Belle's devices (yeah, she's the inventor in the 2017 version), and filled with tiny trinkets that just so happen to be Easter eggs to other Disney films. In a panning shot, viewers get a full look at Maurice's work table, where they'll see a small canoe. 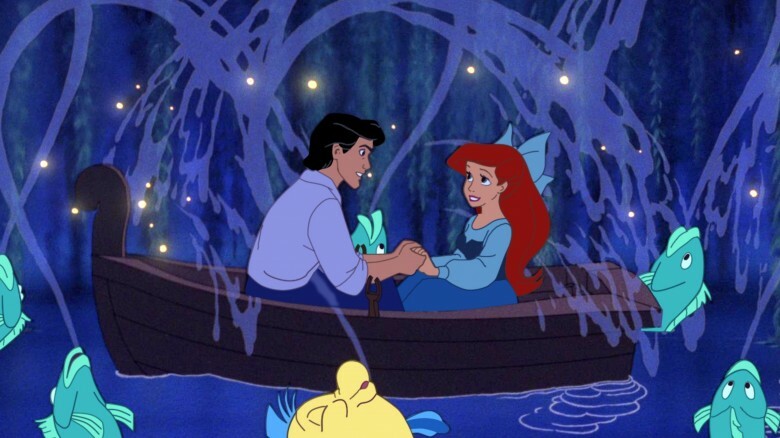 Sitting inside the boat are a man and a woman holding hands, oddly similar to the aquatic moonlit scene from The Little Mermaid during which Sebastian encourages Prince Eric to "kiss the girl" as they drift along the river. The miniscule Disney callbacks don't stop with The Little Mermaid; in fact, Papa Maurice's work table proves to be a treasure trove of Easter eggs. Near a candlestick and just behind a silver rhino statue, fans can spot a small elephant that looks to be made by the House of Fabergé, and the animal's saddle should look fairly familiar. Additionally, although Maurice's version is much smaller, it's carrying something quite important: a scaled-down version of what appears to be the Taj Mahal, the marble mausoleum after which Aladdin's Sultan Palace is loosely designed. It's double the fun here on Maurice's desk! 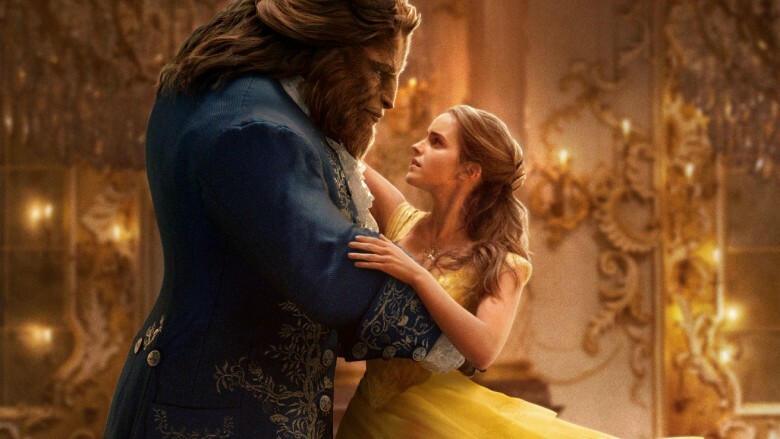 This is sure to make many fans happy: the original source material is totally honored in the live-action Beauty and the Beast. We're talking the 1740 fairytale written by French author Gabrielle-Suzanne Barbot de Villeneuve, of course. (Sorry, Disney. She wrote it first.) But don't be shocked if these sail past your head; they're pretty well-hidden. The fairytale upon which the beloved story is based, La Belle et la Bête is hinted at in Maurice's travels; the manner in which he lands inside the Beast's dungeon as prisoner is exactly the same as it is in the 18th-century tale. 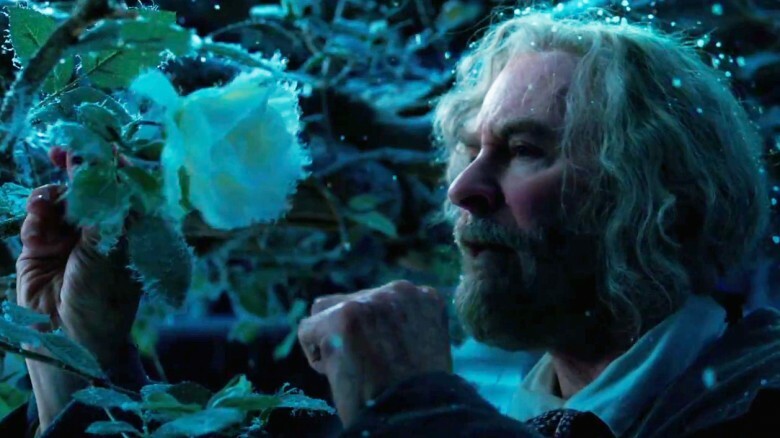 Belle's father finds the loveliest rose in Beast's front gardens, hoping to pluck it and bring it home to her, but ends up imprisoned and accused of theft. The homage extends even beyond the film itself. Fans can see "La Belle et la Bête" typed before the Disney title during the ending credits. There's yet another nod to the OG tale. During a conversation with Maurice, brawny bad boy Gaston (Luke Evans) refers to their provincial town as "village Villeneuve," clearly named after Gabrielle-Suzanne Barbot de Villeneuve herself. 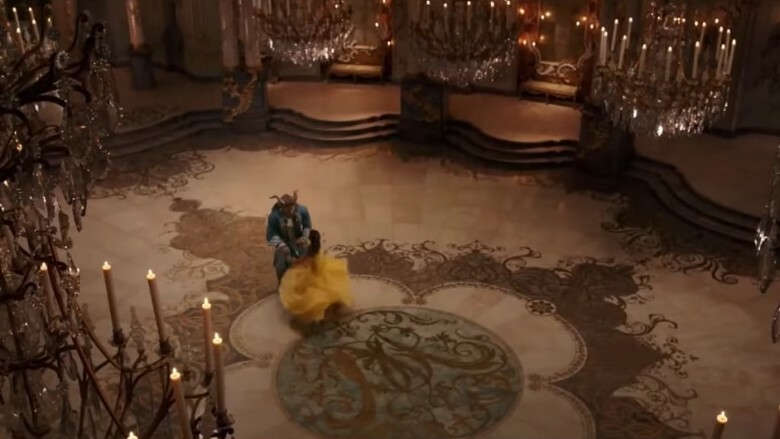 Now, it wouldn't be a proper Easter egg-filled Beauty and the Beast film without something hiding inside the ballroom. Right at the outset, viewers can get a look at a pre-curse Prince Adam hosting what director Bill Condon describes as "an international debutante ball." We see the breathtaking room again during the big dance at the end of the movie, and in both scenes, there's a reference that's easy to miss in all the beautiful pageantry. Focus your eyes on the ballroom floor, and you'll see a teensy-tiny, ornate detail inscripted into the marble. Right in the middle of the motif is a monogram: "WD," for none other than Walt Disney. Don't believe us? Beauty and the Beast production designer Sarah Greenwood confirmed it herself. Something tells us Walt wouldn't mind Emma Watson and a CGI-rendered Dan Stevens waltzing on his initials; he may even be flattered. No, we're not talking about the rumored "I can't remember what I've forgotten" moment that seemed distinctly similar to Neville Longbottom's lapse in memory in Harry Potter and the Sorcerer's Stone; that's been dispelled and debunked by director Bill Condon, who put it down to an unintentional connection. However, there is still a subtle hat-tip to the magical movie franchise, coming in the form of a fluffy feathered friend. When Belle and the Beast are gallivanting through the gardens and spending time with Philippe the horse, singing "Something There" as they realize they're falling in love, there's what feels like an intentional, held pause as the camera focuses on a white owl in the foreground. 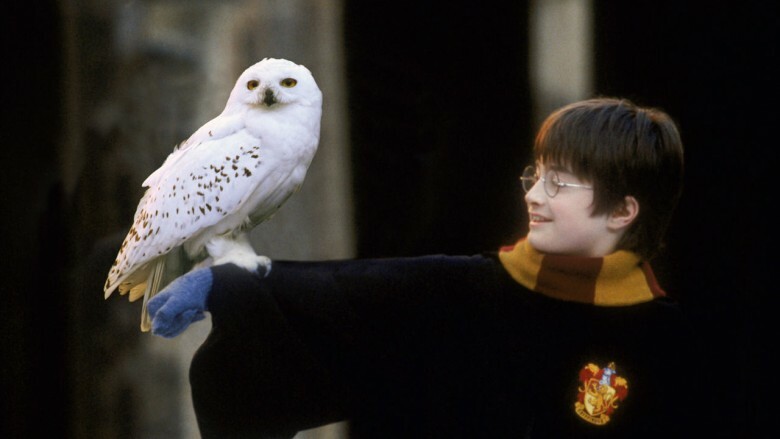 This little creature looks eerily similar to Hedwig, the aviary companion Harry Potter keeps at Hogwarts. A clever and kind way to honor lead actress Emma Watson's deep history as Hermione Granger in the HP franchise, this Easter egg is as a subtle as it is sweet.